You know how there are times when Friday just needs a cookie? Yeah, well sometimes Tuesday just needs a little cinnamon and chocolate breakfast action. Cause there are days where coffee just isn’t enough, and you need a little boost from the really good things in life. 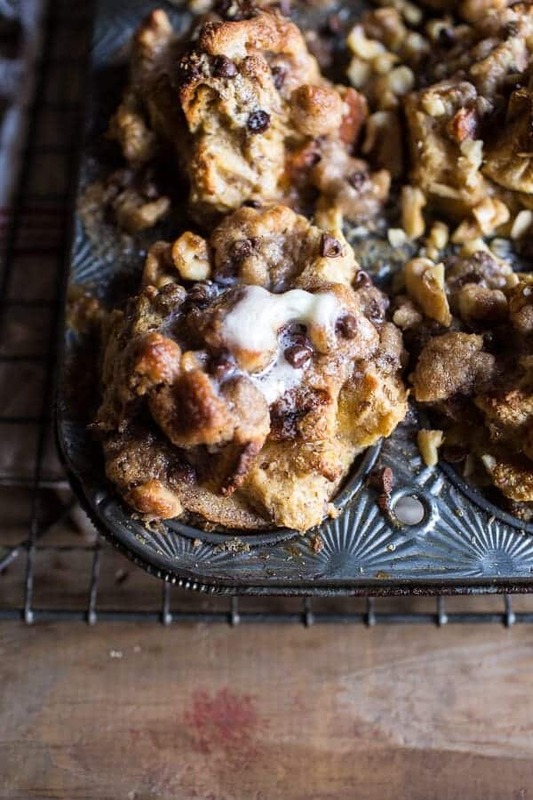 But let’s be real, the honest reason for the french toast muffins?? A really stinkin good reason to get outta bed. Yes, <–Truth. Sometimes… ok, all the time, it’s kind of hard to get myself outta bed. Come on, you know you are right there with me. I have like five gazillion alarms set to go off, and well…I hear NONE of them! It’s quite an amazing thing actually. But french toast waiting in the fridge to be baked?!?!? YESS. That gets me right out of bed. <–No exaggeration. Also, has anyone noticed that as the mornings get cooler and cooler, and we move closer to fall, that it’s especially hard to move from the under the covers (which umm, I have three of… yeah, three heavy DOWN blankets that I huddle under at all times…it’s the best)? Cause my 30 degree mornings are brutal. Like I really just want to hide under the covers till it hits at least 40, and then drink a steaming cup of coffee because well… I drink coffee now… and it’s everything. Hello, there is challah bread, chocolate and cinnamon streusel involved, how could that not make a person happy to be up?!? 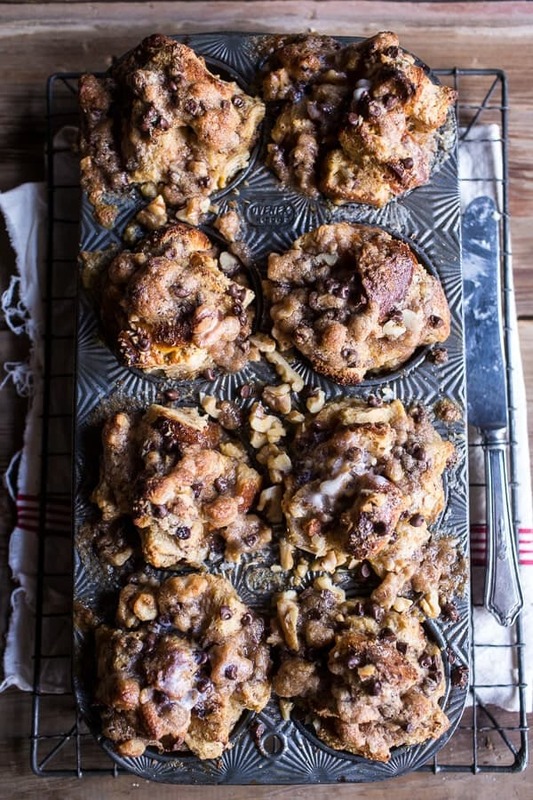 AND, they are french toast muffins, which is just beyond cute, which makes them ten times better! Cute food is the best! 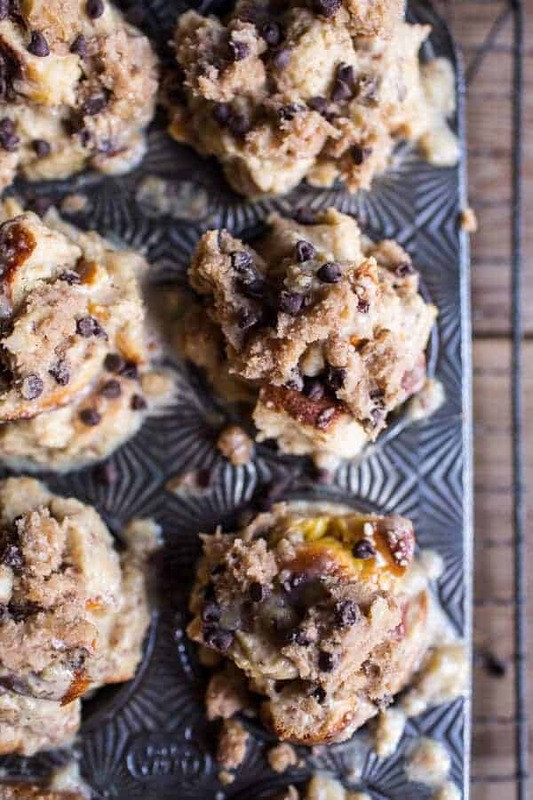 And, and, and…you can make these the night before so that literally all you have to do in the morning is bake them. If you live alone, I highly recommend doing this on Sunday morning. Then you have THE BEST breakfast for the entire week….or maybe the best midnight snack, for when the cravings hit? I mean, hey, if you live alone embrace it right?!? 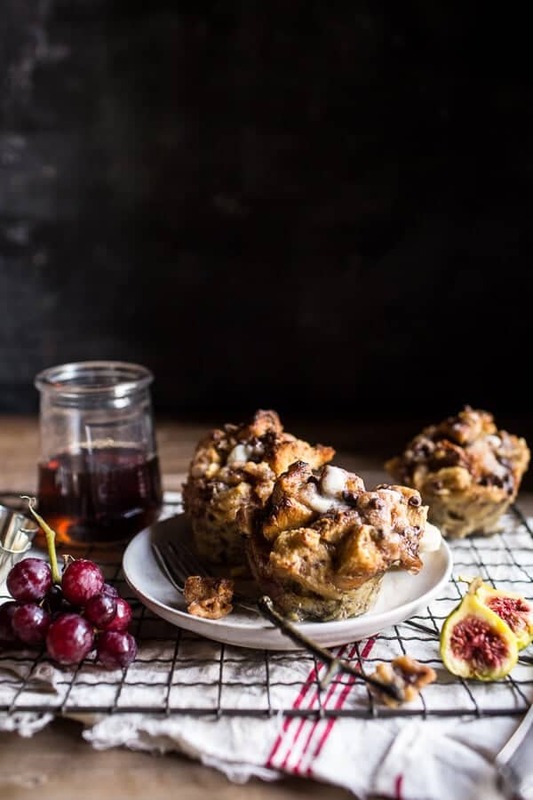 Here’s the deal, seeing as these cute little muffins are meant to be breakfast and not dessert, I tried my best to make them as healthy as possible….shh, don’t tell anyone about the streusel though, cause well, that NEEDED a little butter and a little sugar. 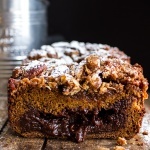 BUT, there is walnuts in the streusel, so that kind of balances things out, don’t cha think?? 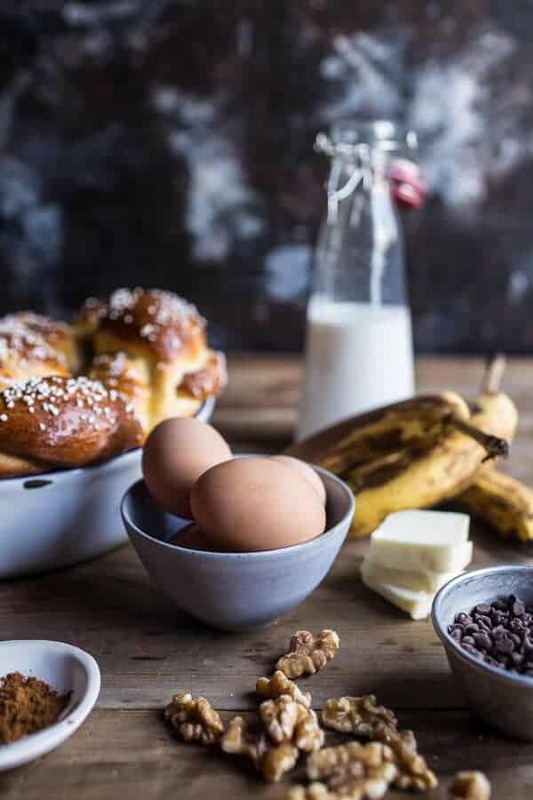 The muffins themselves are full of all good things, whole wheat challah bread, bananas, eggs, honey and even some flax. So you see, health food! Plus, anything with banana bread means kind of healthy, right? At least that’s the way my mind sees it, so go lets with it. Remember it’s Tuesday, you need the extra deliciousness to get you through the rest of the week. OK, and lets talk about the whole banana bread thing. 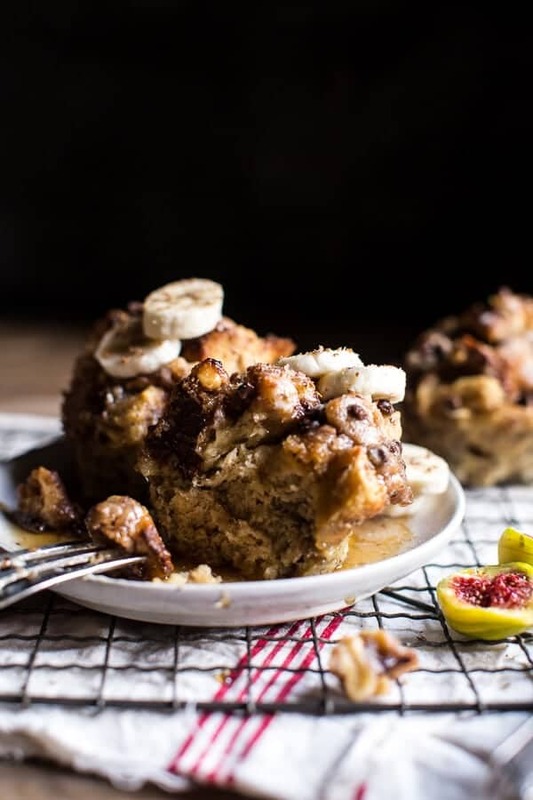 I didn’t use actual banana bread because I really wanted these french toast muffins to be light, not dense. So instead I used my whole wheat challah bread and a banana “batter” (so mashed bananas mixed with eggs, milk, vanilla and cinnamon!). Honestly, these little muffins could not have turned out better. All they need is a little drizzle of maple and a pat of butter and then…YUM. And maybe some extra banana slices too. I kind of love bananas though AND they are pretty much the only fruit I like to pair with chocolate. Did I even mention the chocolate?? I know, I know. 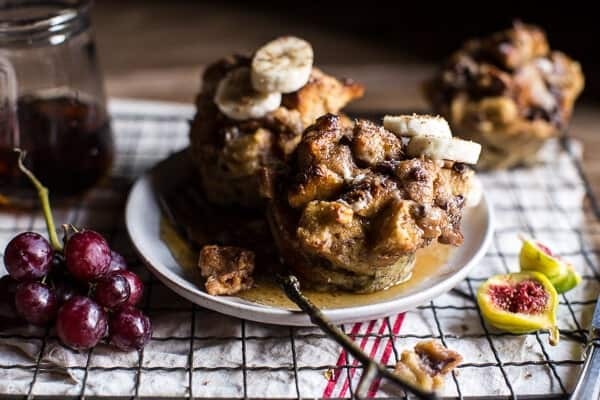 The best french toast muffins! YUMMERS! 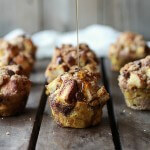 The honest reason for the french toast muffins?? A really stinkin good reason to get outta bed. 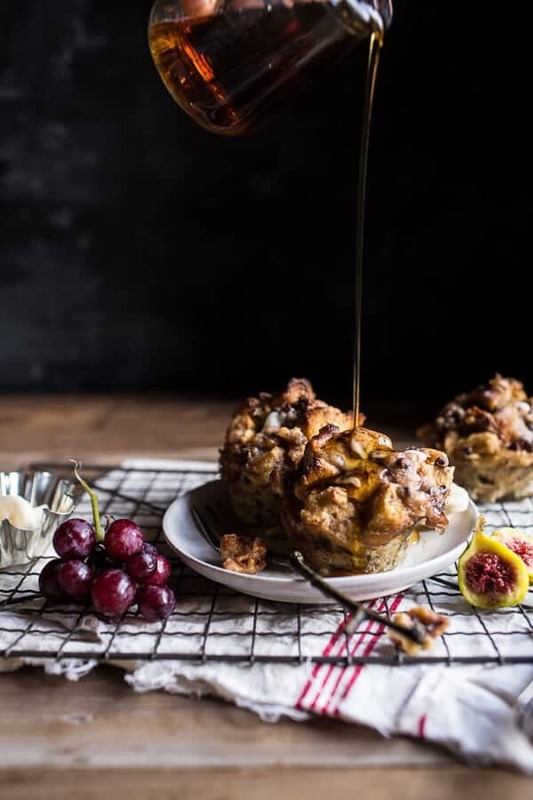 Grease a 12 cup muffin tin with cooking spray, butter or canola oil. In a medium bowl, whisk together the milk, eggs, mashed bananas (I just mash mine with a fork in the bowl) honey, vanilla, ground flax and cinnamon. To the milk/egg mixture, add the cubed challah bread and the chocolate chips. Gently toss to coat, being careful to not break up the bread cubes too much. Divide the bread among the muffin cups, pouring any remaining milk/egg mixture left in the bowl over the muffins. Cover the muffins with plastic wrap and refrigerate for 30 minutes or up to overnight. When ready to bake, preheat the oven to 350 degrees F. and remove the muffins from the fridge. Let sit at room temp. While the oven preheats make the streusel, in a small bowl, combine butter, brown sugar, flour, cinnamon, and walnuts. Mix together with your hands, until you have a crumbly mixture. Remove the muffins from the refrigerator and sprinkle the muffins evenly with the streusel topping. Bake for 25-35 minutes or until tops are golden brown. Let the muffins cool for 5 minutes. Use a butter knife to loosen the edges and then pop them out. 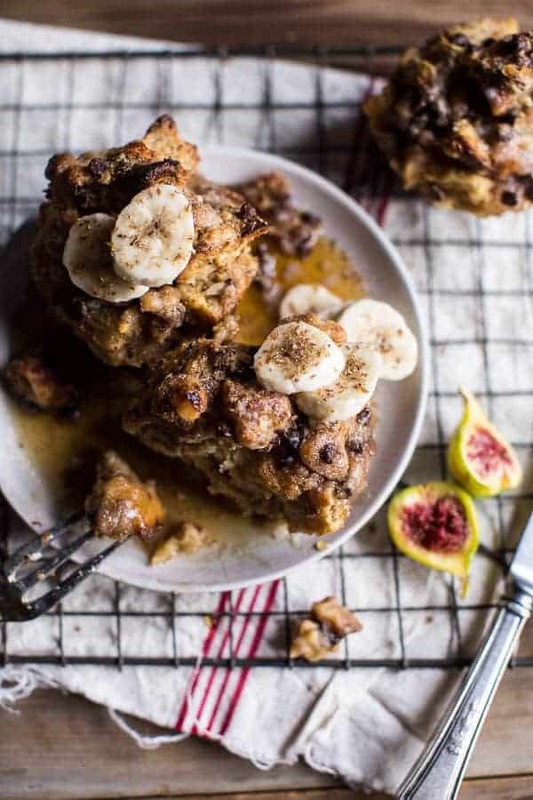 Serve with maple syrup, butter and bananas if desired. *For a no fuss version, bake the french toast in a 9x13 inch pan. Add the bread cubes and chocolate chips to a 9x13 inch pyrex pan and pour the egg mixture over the bread. Use you hands to toss the bread with the egg, Cover the dish with plastic wrap and refrigerate for 1 hour or up to overnight. Add the streusel and bake as directed. Tuesday brunch date?? <–DO IT. this looks insane. your pictures are SO gorgeous!! Looks delicious. Thank you so much. I’m so with you on not wanting to crawl out from that cozy mountain of blankets in favor of facing the craziness going on in the world. But I totally agree that if there’s french toast involved is a whole other story! These muffins look bomb, Tieghan! Love em and totally pinning! This sounds good, this looks good, so I’m guessing this must be pretty good!! 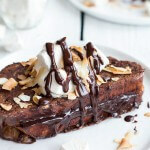 Chocolate Chip Banana Bread French Toast. Oh my. I can’t believe you combined all of these delicious things into one muffin!!! Yum, Yum and Yum !!!! Oh my word !!! I am so hungry now for these. I will have to make a double batch, trust me !!! Pictures tells complete stories of your recipe, its truly delicious. Yea, so I need to be making these ASAP! I think I need this for breakfast…now! Such a neat flavour! 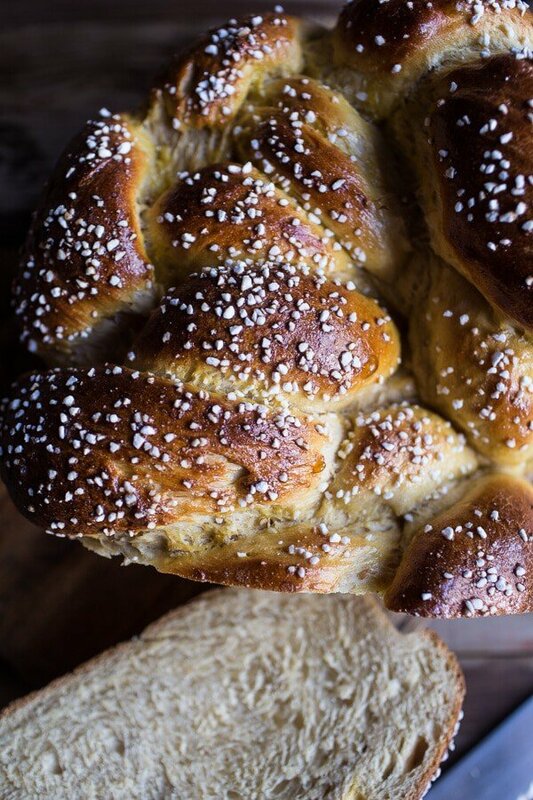 At first I thought the challah was going to be banana…but then I saw what was happening here – a purely delicious mish-mash of fun! Yum! 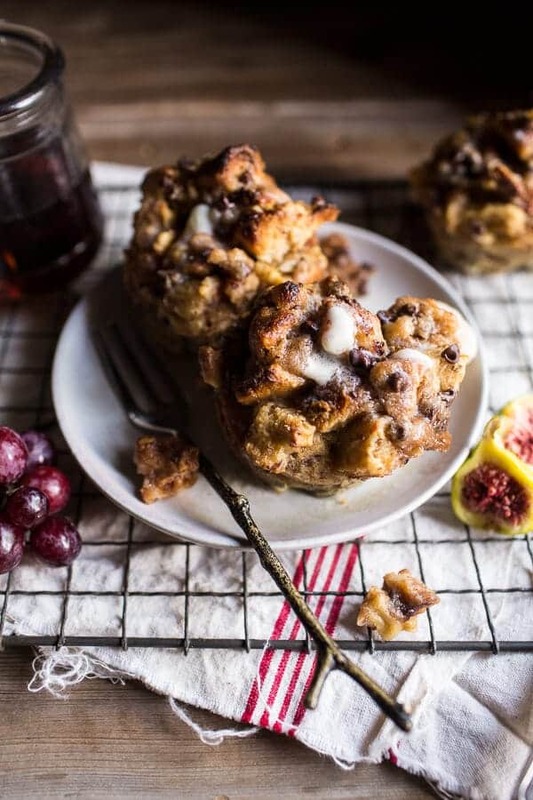 You are convincing indeed- feeling like I need to make these muffins soon! And I am the same- I can totally get out of bed if I know I need to get something in the oven! This looks incredible! I love the banana batter idea. With cinnamon and chocolate, and fresh bananas? This is amazing. Wow, wow, wow! I know what’s for breakfast tomorrow! I would jump out of bed and run to the kitchen for these muffins of goodness. Your photos never fail to leave me in awe. 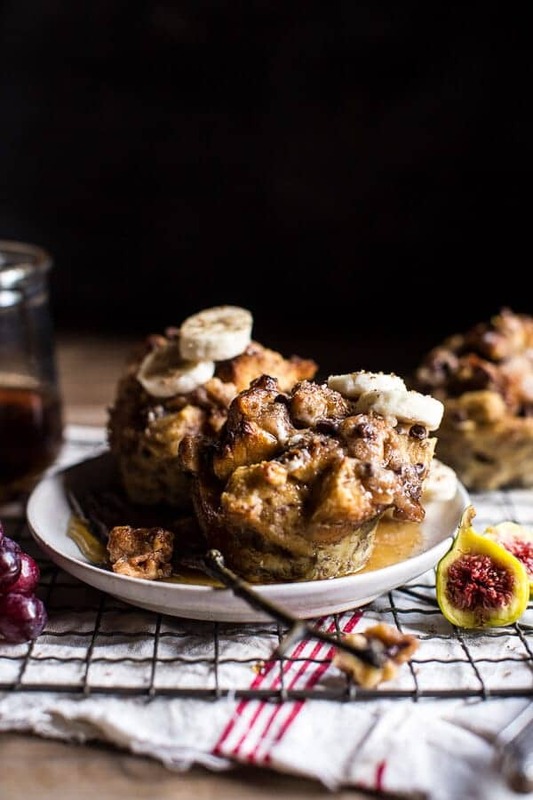 These french toast muffins look so easy I just might have to make them for weekend brunch! This is so me. LOVE banana and chocolate together!! 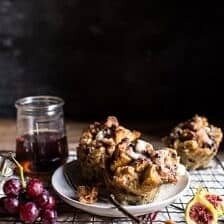 So gorgeous, these muffins are fall perfection! when i got your email, at first I just saw “Chocolate Chip Banana” which was enough for me to open right away. then to see that next to ” French Toast” and “Cinnamon Streusel” made my mouth water. Lol. This is the kind of breakfast I need to get me out of bed! Yum! These were easy and fast to make. I found them too chocolatey – is that even a thing? So next time I’m going to try reducing the amount of chips and maybe replacing the streusel with some crispy bacon. Can’t wait for the book! Oh YES YES YES YES YES <3 banana bread and FRENCH TOAST OH YEAH BABY! LOL I just drank a lot of green tea so I'm so excited now! 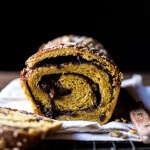 This recipe looks amazing and I HAVE to try it ASAP! Hello! quick question! 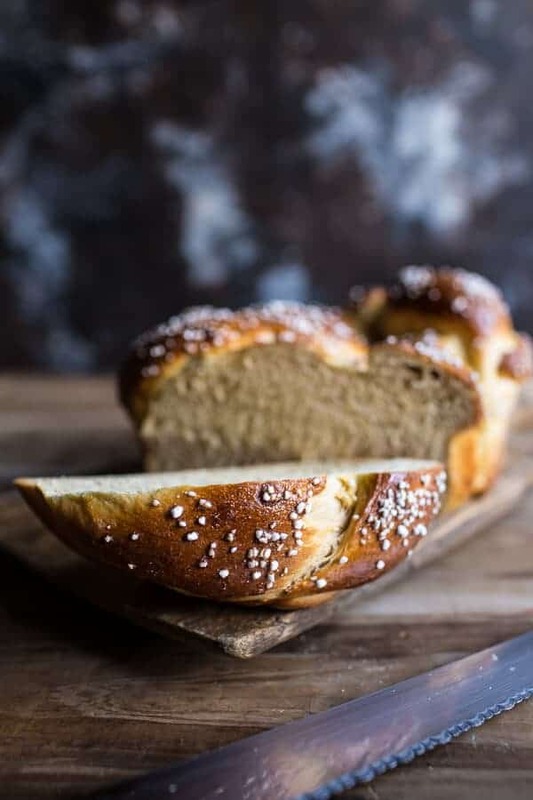 Is there any other kind of bread (maybe even store bought bread) that could possibly replace the Challah bread? This looks very yummy! Yes! You can use your favorite bread, store bought works great! I am so glad you loved this recipe Julie! Thank you so much! Hi! Can you use any milk with these? Thanks!